“When you hear hoofbeats, think of horses, not zebras,” the late Theodore Woodward, a professor at the University of Maryland School of Medicine, cautioned his students in the 1940s. Woodward’s warning is still invoked to discourage doctors from making rare medical diagnoses for sick patients, when more common ones are usually the cause. And while many Americans have worried about contracting Ebola—in viral terms, a kind of “zebra”—more commonplace microbial “horses,” such as influenza and measles viruses, continue to pose far greater threats. For instance, a large multistate measles outbreak has been traced to Disneyland theme parks in California—while this year’s strain of seasonal flu has turned out to be severe and widespread. One obvious conclusion is that many microbes remain a harmful health menace, expected to kill hundreds of thousands of Americans this year. Another—speaking of Disneyland—is that much of America appears to live in a kind of fantasyland, thinking that it is protected against infectious disease. One in five Americans gets the flu annually, and up to 49,000 a year die from it. Flu costs the country $10 billion a year in health care spending, and $16 billion in lost earnings. Even though this year’s flu vaccine is less effective than normal due to unanticipated changes in the H3N2 virus, in most years the flu is largely preventable. Yet Outbreaks notes that half of the population was vaccinated against seasonal flu only in 14 states during last year’s flu season—and only about one in four health care workers got a flu shot. The failure to vaccinate all pre-school children on time leaves 2 million U.S. children a year “unnecessarily vulnerable to preventable illnesses,” the report says. According to the CDC, many of those who contracted measles in the current outbreak weren’t vaccinated. And with a growing number of so many unvaccinated children around, the goal of achieving herd immunity is imperiled. Even the best vaccines aren’t 100 percent effective—and the CDC has noted with concern that six people previously vaccinated against measles still fell ill amid the current outbreak. The report drives home that “we are only as prepared for these threats as the community that is least prepared among us,” observes Paul Kuehnert, DNP, RN, director of the Bridging Health and Health Care portfolio at RWJF. And Outbreaks identifies scores of other risks beyond common communicable diseases, including food-borne illnesses like salmonella and hospital-acquired infections like MRSA. Vulnerability to infectious disease outbreaks is just one aspect of the nation’s health defenses captured in another RWJF-sponsored effort: the National Health Security Preparedness Index. A composite of 194 measures, the index depicts the capabilities of the 50 states in six areas: health security surveillance; community planning and engagement; incident and information management; healthcare delivery; countermeasures management; and environmental and occupational health. Thomas V. Inglesby, MD, who directs the UPMC Center for Health Security, and who chaired the steering committee behind the preparedness index, describes it as “the first really comprehensive attempt to measure preparedness in all its dimensions and improve quality over time.” An interactive map on the index’s web site illustrates which states rank highest, including Virginia, New York, and Utah. At the low end are Alaska, Georgia, and Arkansas. Overall, the country scores 7.4 out of 10. The index didn’t label it as such, but that’s about a C grade. Not surprisingly, a number of states aren’t happy with the rankings, or their place in them. But the results shed light on what states must do to boost their preparedness, while future installments of the index will also help policy-makers gauge progress, Inglesby says. In other words, think of the preparedness index as a road map for helping us get out of fantasyland, and confront reality on the critical topic of health security. What have we learned from recent infectious disease outbreaks, like Ebola and H1N1? 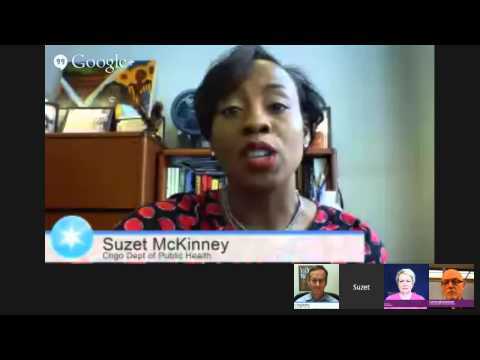 On Friday, February 6, the Foundation hosted an online chat with notable disease prevention experts, Tom Inglesby, MD, chief executive officer and director, UPMC Center for Health Security and Suzet McKinney, DrPH, MPH, deputy commissioner, Bureau of Public Health Preparedness and Emergency Response and Division of Women & Children’s Health, Chicago Department of Public Health, on the state of preparedness in America, including a discussion about the new National Health Security Preparedness Index. Susan Dentzer, Senior Policy Adviser at the Robert Wood Johnson Foundation, former Health Affairs Editor-in-Chief and Health Policy Analyst, The NewsHour with Jim Lehrer, is one of the nation's most respected health and health policy thought leaders and journalists. Read more of Susan’s posts.